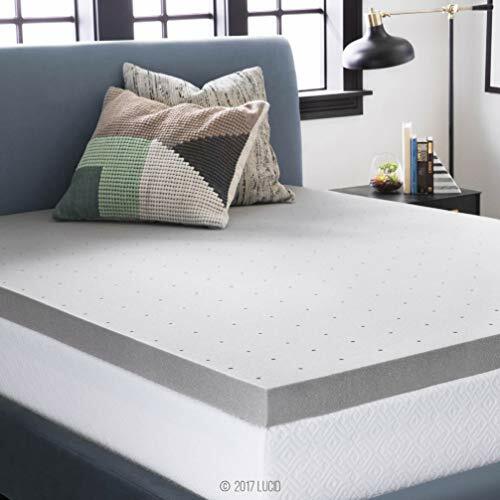 If you need to add more comfort and softness to a firm mattress then the Lucid Memory Foam Mattress Topper could be just what you're looking for. Memory foam mattress toppers can be a great addition to your bedroom. Especially if your current mattress feels too firm. Because adding a high quality memory foam topper to it can completely change your sleeping experience. As it instantly makes your mattress more forgiving on your body, which helps to cushion you and relieve the pressure on your pressure points as you sleep. And this can help you get a great night's sleep without going to the hefty expense of having to replace your mattress. However, some memory foam toppers can be TOO soft. Which means you sink into them too far and throw your spine out of alignment. Putting you back to square one! However, the Lucid Memory Foam Mattress Topper is a great choice if you want to avoid this. As it has a dense enough memory foam to keep you in a good alignment, supporting your neck, back, and shoulders. But it isn't so dense that it loses all of it's comfort or pressure relieving abilities. So you can get a nice mix of comfort and support with this one. Which is just what you should be looking for in a topper to help relieve your night-time back pain. 3" thick and made from high quality, ventilated, open cell memory foam. Hypoallergenic and resistant to allergens and dust-mites. The soft memory foam cushions your body relieving pressure on your pressure points. This topper has a soft and plush feel to it. Ventilated design makes it cooler to sleep on. Great choice for softening a mattress that is too firm. At the softer end of the density scale so built more for comfort than for support. However should still be dense enough to keep your spine in alignment as you sleep. The memory foam cradles your body which helps to ease back, neck and shoulder pain. The open cell memory foam spreads pressure evenly across the topper. 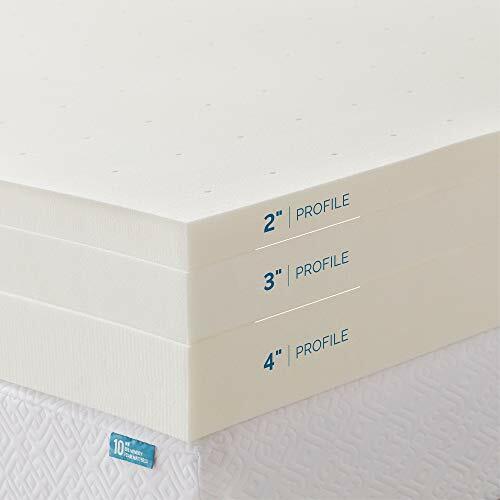 The Lucid Mattress Topper is 3" thick and made from high quality memory foam that has a density of 3 lbs/cubic ft. This means it is comfortable but not too soft. And the foam itself is made with an open cell structure which makes it more resilient and long-lasting. So it's less likely to sag and leave body indentations over time. The memory foam in this topper is also ventilated with small pinholes to allow air to flow through it. Which is a great feature as it makes it cooler to sleep on than regular memory foam toppers. This means​ it has been tested for your safety and found to contain no harmful chemicals and to be low in VOCs (volatile organic compounds). So this topper is much safer, healthier, and cooler to sleep on than regular memory foam toppers. Why Is It Good For Your Back? 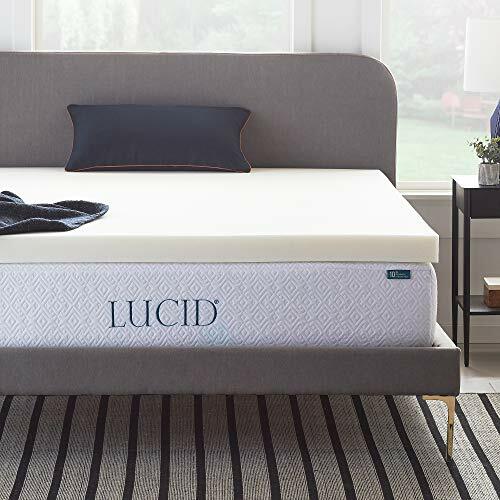 Can the Lucid mattress topper make mornings like this a thing of the past? When you sleep on a firm mattress it can put a lot of stress and strain onto the main pressure points in your hips, shoulders, and lower back. So it's no wonder you sometimes wake up with various aches and pains in the morning. However, memory foam toppers can be a great help for easing these aches and pains during the night. This is because they mold to your body as you lie on them, cradling and cushioning you. Which relieves pressure on your pressure points and allows your body to rest and relax. But to get these benefits you need to be using a memory foam topper with the right density. As if it's too soft (less than 3 lbs/cubic ft) you might sink in too far which throws your spine out of alignment. And if it's too firm (5 lbs/cubic ft or over) it can add stress onto your pressure points again, leaving them aching and stiff in the morning. So ideally you need to get a topper between 3-5 lb/cubic ft to give your back the best chance, as this is the sweet spot for a foam that can support the natural curve of your spine. And the Lucid mattress topper just about makes it into this range. As at 3lbs/cubic ft it's at the softer end of the scale so offers more comfort than it does support. But it should still offer enough for most people to be able to sleep comfortably while still keeping their spine in a correct alignment throughout the night. Which is great news for your back. And the open cell structure of the memory foam spreads your weight evenly across the mattress as you sleep. Which will help to ease pressure, tension, and stress in your body further. And hopefully get rid of that dreaded back pain! Memory foam is well-renowned for it's comfort and the Lucid Mattress Topper certainly doesn't disappoint in this regard. As it's a really comfortable topper to sleep on for a number of reasons. Firstly the 3 lbs/cubic ft density means it's softer and more giving than other medium density memory foam toppers that are good for people with back pain. This gives it a plush feel that will really help you to relax and get into a deep and restorative sleep. As it will mold to the contours of your body as you lie on it, cushioning you and giving you a weightless feeling. ​And the side benefit of this pressure relief is that it's more likely you will feel comfortable enough to stay in one position as you sleep. So it can really cut down on the need to toss and turn frequently and allow you to get a really nice and uninterrupted ​sleep. The quality and design of the foam adds to the comfort too. As the ventilation holes mean that air can flow through it easier, which makes it cooler to sleep on than other memory foam mattress toppers. And this is a big deal as memory foam is notorious for sleeping hot, and the last thing you want is to feel hot and sweaty during the night. 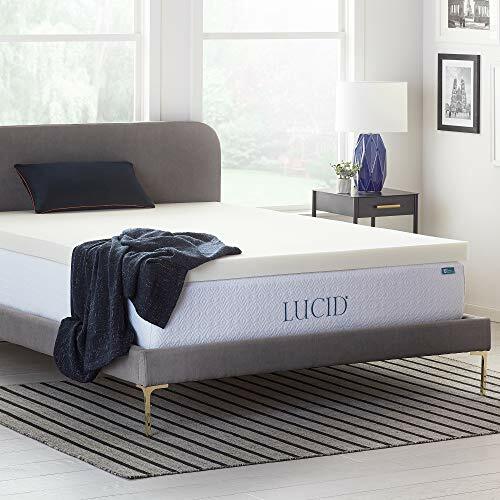 So if you need to add cool comfort to a mattress that is too firm the Lucid mattress topper is a great choice. The Lucid Mattress Topper comes in a variety of sizes and material types. So you can get one to fit any bed from a twin (38" x 75") right up to a California king (72" x 84"). 2" - Will give you more pressure relief and slightly less comfort. This can be a better option for lighter people. 3" - This is the thickness of the topper in this review. Great for adding comfort and pressure relief to a firm mattress. 4" - This one gives extra support and comfort for heavier people. Being able to tailor your topper to suit your needs in this way is great. And Lucid also make toppers using a variety of different materials for those that want to tweak it further. So in this review I've focused on their original ventilated memory foam topper which I think is a great choice. However, they also make them in gel-infused, lavender-infused, and bamboo charcoal varieties. And each one brings slightly different benefits alongside those I've mentioned in this review. 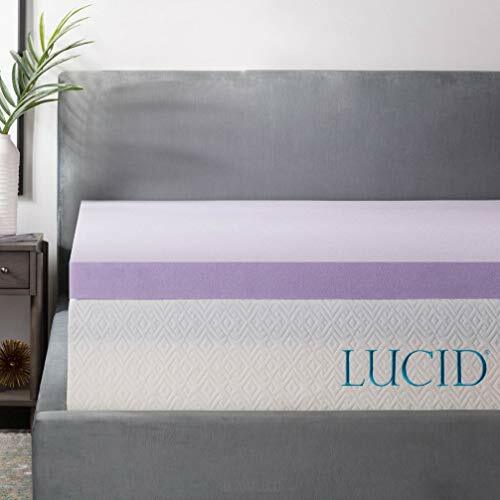 By infusing their memory foam with an advanced gel material, Lucid have made an even cooler topper to sleep on. This is because the gel helps to distribute your body heat rather than trapping it. So you'll have less chance of getting hot and sweaty with this one. The smell of lavender is well known for having naturally calming and relaxing properties and it's great for helping people sleep. So Lucid have tried to incorporate this effect into their toppers by making one with a memory foam that is infused with the scent of lavender. So it will give off a subtle lavender smell as you sleep on it. Which can help you to create a more relaxing and comfortable sleep environment. 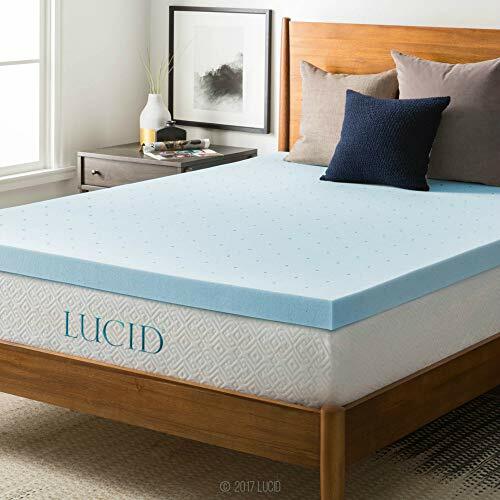 By using bamboo charcoal in this memory foam topper, Lucid have come up with one that can bring you a variety of benefits. Firstly, the bamboo charcoal helps to wick away moisture as you sleep, which keeps you comfortable and regulates your temperature. And this is good for keeping you cool in the summer but warm in the winter. And finally sleeping on this topper is especially good for people with allergies. Lucid offer a 30-day returns policy with all of their toppers. Which means if you can't get on with the feel of memory foam or the smell then you can return it for a full refund. So you are covered nicely here. Although getting it back into it's original box might be a struggle! They also offer a 3-year warranty which is really good for a memory foam topper. So if there are any defects in the material or workmanship within this period they will either repair it, replace it, or refund you. However, this doesn't cover things like general wear and tear. So all in all I think the Lucid Mattress Topper has a lot going for it for people with back pain. Firstly, it's a great choice for making a firm mattress softer and more forgiving. And by sleeping on a softer surface you can get pressure relief that allows your whole body to relax and unwind. But while it's soft it still has a medium density. Which should prevent you from sinking in too far and keep your spine in the correct alignment. This will ease the strain and tension on your muscles as you sleep and help you to relax. So while it's not as supportive as higher density memory foam toppers and doesn't come close to the support of a latex topper. It can still bring great comfort and pressure relief to your mattress. Which will help you to wake up feeling refreshed and relaxed in the mornings rather than stiff and sore. And it's also great value for money too if you want a high quality topper at the lower end of the price scale. Great for adding comfort and pressure relief to your firm mattress. Eases the pressure on your pressure points, relieving back, neck, and shoulder pain. Molds to your body but still has enough density to keep your spine correctly aligned. The open cell memory foam spreads pressure evenly. It also prevents sagging over time, making it more durable and longer-lasting than regular memory foam. Ventilated pinholes make it more breathable and cooler to sleep on than other memory foam toppers. At the softer end of the medium density scale so may not have enough support for some people. Also memory foam can't match the back support offered by a latex mattress topper. Doesn't come with a cover. And to see how the Lucid Ventilated Memory Foam Mattress Topper compares against it's rivals you can read my review here of the best memory foam mattress toppers for people with back pain.